I've seen many people who have made their mind set completely wrong about the hidden secret codes. According to them those hidden service menu codes are made only to destroy your Smartphone. But sorry to say the time has come to change your thinking if you're one of them. It's not so that they are always intended to do something malicious. Most of the programmer and tech geeks are using them to enhance the performance of their phone. One can come across hundreds of issues on Android such as low battery performance, slow charging, app crashing, wifi issues, call drops, connectivity issues, syncing issue,and many more. At that time hidden codes are proved to be boon. You can easily troubleshoot some most common issue using them. Today we're going to share a complete list of secret codes of Samsung. 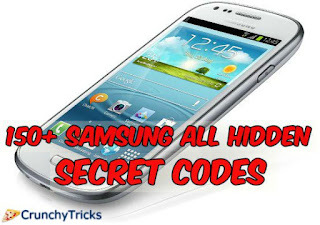 These hidden codes are compatible with almost every version of Samsung galaxy series such as star, corby, grand, grand 2, core 2, ace, young, pocket, mega, S duos including Samsung galaxy s2, Samsung galaxy s3, Samsung galaxy s4, Samsung galaxy s5, Samsung galaxy s6. Check out the list below according to their use. We've covered almost all the service mode codes here with their description. So this was all about Samsung secret codes. If you have more working codes then mention them below or if you find any correction in the above mentioned coded then feel free to tell us. For any doubt or query comment below in the comment section. Good codes..that might get someone "newer" in a bit of trouble.. 😈 one "code" I tell the newer people to do is *#0*# this will bring up a menu, in a format that is so much easier to navigate.. & then you don't need to worry about the 150.Anyhow, thanks for the article & all your hard work!! Sorry, I meant to say that code I gave out is for Samsung devices. I was told it works on other manufacturers, but I haven't verified that! Enjoy! !